Dry, scruffy, and struggling is no way to go through life, but these are conditions often encountered in cultivating water-challenged New Mexico landscapes. Fortunately, there’s a revolution afoot that looks beyond xeriscaping to the next generation of design: permaculture. Melissa McDonald, her husband, Nate Downey, and their company, Santa Fe Permaculture, use this approach to put the beauty back in the beast of high-desert gardening. Master gardener and landscape architect McDonald handles the creative-design end, while Downey—an energetic, self-described “landscape changer”—is a popular lecturer and teacher, and the author of Harvest the Rain: How to Enrich Your Life by Seeing Every Storm as a Resource (Sunstone Press). Together they have spent nearly two decades designing and installing some of the most beautiful gardens in the capital city, and changing the notion of what a water-wise landscape can look like. McDonald’s skill lies in crafting attractive gardens that ultimately thrive on less water than most. She sets white roses, yellow prairie zinnia, and purple-flowered butterfly bushes alongside tomatoes, corn, and kid-pleasing teepees made of bean vines. By grading patios into basins that catch water, reshaping the land with swales, building healthy soil by composting and mulching, capturing roof water in underground cisterns, or using plants that are well adapted to the Southwest, McDonald is following a basic principle of permaculture: When we create the right conditions, nature will then do the work for us. Going further, McDonald designs pumice wicks. These lava-rock–filled trenches are hidden under the garden, where they capture rainwater runoff from roofs and release our most valuable resource slowly to the roots of nearby plants. Along with cultivating beauty, perma-culture designs encompass all the things that affect the environment, including children, animals, food production, outdoor living, recycling, composting, sun, shade, and wind. It’s all part of the picture. McDonald and Downey are showing us how to create economical, environmentally friendly landscapes that are also sensual and seductive parts of our daily lives. 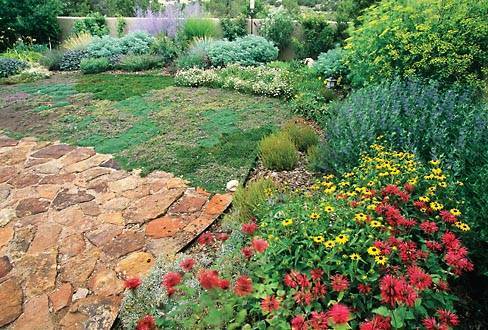 Develop a long-term plan before installing key components of your landscape. Many folks install large trees, planting beds, patios, walls, and fences without much forethought, but this approach limits a property’s potential and can be very costly to remedy. Growing at least a little bit of your own food is tasty, healthy, fun, and soul satisfying. Annual and perennial edibles can be integrated into the landscape or protected in a wildlife-safe magic spot. In arid lands like ours, determine your pathways early on. Wherever people, pets, and vehicles wander freely, the soil becomes compacted and much less able to absorb precious water. Comfortable outdoor niches enhance the value of your property by including shade trees, pergolas, windbreaks, privacy screening, and noise-abating plants. The downspouts from your roof are excellent sources of water for plants. Capturing roof water reduces your water bill and carbon footprint, and prevents sediment from polluting rivers downslope. Our environment is challenging, so it’s best to build on your successes rather than take on too many landscape projects at once. To learn more, refer to Downey’s book, Harvest the Rain: How to Enrich Your Life by Seeing Every Storm as a Resource, and consult sfpermaculture.com and permadesign.com.